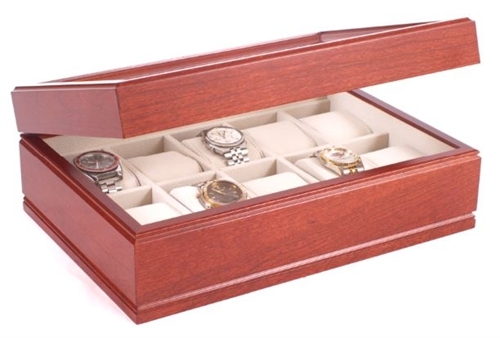 Ten watch glass top storage chest with soft-suede "watch pillows". Solid cherry hardwood with cherry finish. Simply gorgeous! Made in USA. 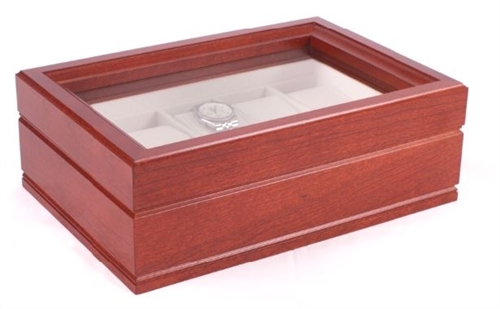 Glass Top Solid Wood Watch Box, Mahogany Finish Solid Hardwood Drawered Watchbox in Mahogany, Glass Top Burlwood Valet Box with Stainless Steel Accents Burl Wood Watch Storage Box with Solid Top and Lock.